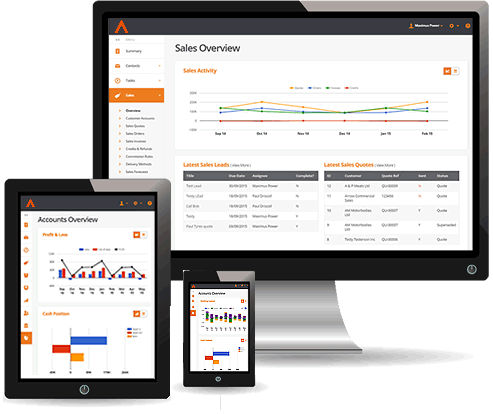 Business Cloud Essentials is a cloud-based ERP software which delivers a single, fully-integrated platform for businesses to use financials, CRM, stock control, supplier and logistics management, payroll and dashboard reporting. The platform is delivered as a Software-as-a-Service (SaaS) so it’s easily accessible through any web browser and the pricing model allows businesses to scale their usage as required. Our ERP software provides business owners and managers with improved efficiencies and streamlined processes through an integrated solution. In today’s fast paced business environment, we know how important it is for businesses to be able to work quickly and maximise productivity. Using Business Cloud Essentials, we help SMEs re imagine the way they work, helping their business scale and grow. Access all business information with one login for Business Cloud Essentials, uniting all data from across the organisation in the software. Reduce manual processing of information and maximise productivity by using one, central system for all business activity. Get a better understanding of your business activity and performance with real-time reporting using Business Cloud Essentials. With ERP software, organisations can benefit from instant access to their data. It’s no longer necessary to be in the office to run your business. Turn on period management to give greater control over your financial transactions. Auto recieve goods on GRNs to increase efficiency when booking goods in. Record GL budgets to enable you to track performance against budget. MRP PO consolidation to simplify your supplier ordering process.